Okay, so I didnt think it all through ahead of time. But when I realized that Dallas and I would have a day in London, returning from a wedding in Finland, I was struck with the opportunity to see The Map. You know the one  The Map that Changed the World, William Smiths original 1815 geologic map of Britain, now immortalized by Simon Winchesters book of the same title. Where was the original map? Dallas and I had both read the book, but we werent confident about the details of where the original copy of The Map is today. So we did what any self-respecting academics would do. We turned to reference material. Normally, the map remains hidden from view, to keep it shielded from the light. The blue velvet curtains remain pulled firmly shut. The hundreds who pass by each day seldom glance up at it  and even if they do, few of them ever ask to see it, and fewer still ever stop to wonder who created it, and why, and exactly how. We wanted to stop, ask and wonder. Curiously, none of the 27 guidebooks of London at Waterstones mentioned William Smith, geology or the Geological Society. But we had a lead. Around the corner, we retreated to the Sherlock Holmes Pub to plan our next step. (I have since realized that this location is not far from one of William Smiths residences, at 16 Charing Cross.) Yes, they had a phone book behind the bar, but it only covered the yellow pages. The Geological Society wasnt in the yellow pages, but the British Geological Survey was. The barkeep wasnt very helpful in the use of the pay phone (Im from New Zealand. I only use my mobile.), but I plugged my 20 p (pence) into the phone and dialed. The recording said that the office would be closed for another week, but that callers could try one of two other numbers for more information. One of the numbers rang for a long time before I gave up. When the other was answered, I explained that I was looking for William Smiths geological map. The person at the other end said she didnt think she could help. I needed to talk with someone else, who wasnt available at the moment. Could we call you back? she asked. No, I said, as I put 20 p more into the phone and imagined the barkeep letting me use the pubs phone for this project. She asked me to call back again in five to 10 minutes, gave me a number and told me to ask for Joan. I want to see William Smiths map of England and Wales, I pleaded. Whats the nearest tube stop? I asked puzzled. So heres my point. If you find yourself in London and want to see The Map, call the Geological Society of London in the morning and ask whether the map will be available for viewing that day. I probably just saved you several pounds (20 p at a time) and an hour or two of your energies. Just be sure you get directions to the Geological Society of London. I never got that far. 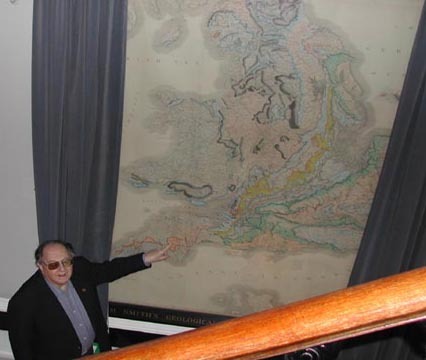 Rossbacher, a geologist, is president of the Southern Polytechnic State University in Marietta, Ga.
You can visit the Geological Society of London online, where you can link to directions and phone numbers, and tour information on how to view William Smiths 1815 map. I am very sorry to hear about Lisa Rossbacher's frustrating experience on her visit to London, when she tried so gamely and failed so miserably to see the William Smith 1815 geological map of Britain  "The map that changed the world." As Simon Winchester's book states, it is to be seen at the Geological Society of London (not the Geological Survey of Great Britain) at Burlington House in Piccadilly. We at GSL have been welcoming people on visits most weekdays at 3:00 p.m., ever since the book was published in 2001. We are delighted by the new public interest in this unique treasure, and that so many people from all over the world take the trouble to come to Piccadilly  often their first stop after landing at Heathrow  and look us up. All information about how to visit the map can be found on the Geological Society of London's Web site. At the moment, there is a "hotlink" to the appropriate page on our front page  in the "Update" box. You can also go straight there. This has links to maps and travel directions, as well as instructions about how to make sure that you come on a day when there is either a viewing or a full 40-minute guided tour by the "functionary," who remains. I have read with interest Lisa Rossbacher's column "Searching for The Map." As a fellow of the Geological Society of London who lives in the United States, I have for many years visited the society, commonly once a year, for participation in society meetings, and studies of busts and pictures of society founders. Gerald Friedman stabds with William Smith's 1815 "map that changed the world." The Geological Society's "Map that Changed the World" is not a unique copy. At Imperial College, within walking distance of the Geological Society, is another copy of this same map, once again signed by William Smith and likewise dated Aug. 15, 1815. A curtain does not protect this map, and students see this real map as they arrive and depart from classes. However, you do not have to travel to England to view this map. Last year, Simon Winchester came to Troy, N.Y., for a lecture at Rensselaer Polytechnic Institute. Two copies of the original map were on display: (1) a copy that Union College owns, and (2) a copy that belongs to the Northeastern Science Foundation, associated with the City University of New York. The latter copy was formerly owned by the president of the Royal Society, but  like others  found their way to American geological collections.